For some people their pride is something which makes them strong, but it can also hold them back in some situations. Being a prideful person can result in being a bit stubborn and afraid to humble oneself. Everyone can struggle with pride in many different ways, but sometimes an abundance of this trait can be something that holds you back and stands in your way. INFJs are often seen as kind and modest people, but they can also possess a sense of pride in some unique ways. INFJs are complex people who can be harder to really peg down than people might expect. They can often find themselves behaving in contradicting ways, and this leaves others struggling to really understand them. Some INFJs might develop a prideful attitude which is often used as a defense mechanism in a lot of ways. Sometimes this sense of pride does stand in their way, since they can be stubborn and afraid of really opening up in ways that might make them feel too vulnerable. ENFJs can certainly possess a sense of pride which might seem a bit hard to come down from sometimes. They often use this as a defense mechanism to keep them from seeming too vulnerable or getting hurt. ENFJs also focus on being prefect and dislike making mistakes, because of this they can sometimes appear prideful. They are simply strong-willed people who don’t want to do anything which might disappoint their loved ones. Sometimes their pride can be something which stands in their way though, especially when they are afraid to really expose themselves or be vulnerable around others. INFPs try to avoid being prideful people, and prefer to remain humble. In most situations they are capable of accomplishing this, but sometimes their inner sense of morals can actually cause them to become a big prideful. INFPs have strong beliefs which are rooted in their inner morals and deep emotions, and sometimes what they believe to be right can cause them to have a strong sense of pride and even superiority. This isn’t something that happens with all INFPs, and is only common with those who do not strengthen their weaker functions. In this case the INFPs pride can certainly stand in their way and prevent them from opening their minds to other options. ENFPs can sometimes appear more prideful on the surface, often to keep themselves from being too vulnerable. Most ENFPs don’t want to appear prideful in a haughty way, they simply want to be able to maintain a strong sense of who they are around others. For the ENFP sometimes their pride can stand in their way, since it prevents them from truly opening up. Most of the time though, they avoid letting this become an issue since they really want to be able to keep an open mind and always connect with those they love. INTJs are strong-willed people who focus on learning and constantly growing. Sometimes their inner strength and sense of pride can actually be something which hinders them in certain situations. For the most part their pride helps the INTJ maintain a sense of confidence in themselves and pushes them towards their goals. While it is often a good thing there are times when the INTJ might fear being vulnerable, and this is connect to their sense of pride in a more negative manner. They don’t want to feel like opening up might leave them feeling like they failed or made a mistake, and so this pride can sometimes hold them back. ENTJs can be somewhat strong and prideful people, and in most cases this is not a bad thing at all. They have a strength of character and the ability to stand by their convictions without fear of what others might think. There are times when the ENTJ might be afraid of showing weakness and so their pride can prevent them from really seeing things clearly. They focus so much on being efficient and not making mistakes, and so they can struggle to really take chances and open up where they might benefit from it. Their pride is sometimes something which can stand in their way, but in most situations the ENTJ is willing to overcome this and move forward. INTPs can actually be more prideful than people realize, but this often comes out as a defense mechanism. INTPs are internal people who can certainly be afraid of getting hurt by those around them, or of being taken advantage of. Sometimes their sense of pride comes from not wanting others to see their weaknesses, and so this can certainly hold them back in some situations. Their pride can prevent the INTP from getting closer to others, or of seeing their intentions clearly. They don’t intend for this to happen but sometimes it does regardless. ENTPs can sometimes appear prideful on the outside, but they do enjoy keeping their minds open. They tend to avoid letting pride stand in their way, since they don’t like letting anything hold them back from moving forward. ENTPs just want to explore their options and be capable of seeing the potential in the world around them. They seek out learning and understanding, and so they like to keep their minds open in order to really accomplish this. In most situations ENTP are capable of checking their pride and taking a chance on experiencing something worthwhile. ISTJs can sometimes be prideful people in certain situations, but they try to remain more down to earth. They are strong-willed and focused on getting the job done without allowing anything to stand in their way. ISTJs are willing to hear people out if they will often useful ideas and information, but otherwise they can become rather impatient with pointless suggestions. ISTJs simply value efficiency and sometimes this means they prefer to get things done themselves. There are occasions where their pride and desire to take care of things on their own can hold the ISTJ back a bit. Most of the time the ESTJ sense of pride and focus is a good thing which helps them move forward in life. They don’t allowing anything to stand in their way and can be very strong-willed people. While in most situations their pride does not actually hold them back, it can hurt them when it comes to intimate relationships. ESTJs can be prideful and struggle to really open up or show vulnerability, and this can certainly be something that holds them back in their relationships. When someone is trying to get closer to the ESTJ their inability to drop their walls can be the thing that holds them back. ISFJs usually don’t like allowing their pride to hold them back, especially when it comes to their loved ones. They focus on maintaining a sense of peace and harmony and often will do whatever it takes to accomplish this. ISFJs aren’t afraid of swallowing their pride if it means they will please someone they care for. This is often something which focuses more on the people close to them though, since they can sometimes exhibit prideful behavior around outsiders or strangers. When the ISFJ is around someone who makes them feel a bit defensive, their sense of pride can sometimes get in their way. ESFJs often try to avoid allowing prideful feelings to prevent them from taking care of their loved ones. They focus so much on tending to their needs and want to please those around them, and so this can help them set aside their pride. ESFJs do have moments though where their desire to be perfect for others can make them appear a bit prideful and incapable of letting their guard down. They can also behave this way more around strangers, since they focus so much on doing what is best for the people closest to them. ISTPs are independent people who tend to avoid allowing their own focus to interact with others all that much. They might be prideful in some situations but they would rather keep to themselves and avoid conflict with others. This is because ISTPs prefer being on their own most of the time and become drained by being around most individuals. Sometimes the ISTPs pride can prevent them from letting people close to them, but the more mature ISTP won’t have this type of problem. ESTPs can be prideful people sometimes, but this often depends on the situation and the subject at hand. When they have something they feel is truly important to them, they can sometimes be a bit prideful about this. This can cause the ESTP to become stubborn and incapable of seeing the other side of the situation. This isn’t something they do intentionally, it simply comes from being strong-willed and somewhat impetuous at times. For the ESTP when someone does not trust their knowledge they can become prideful and this can prevent them from really connecting with that person or understanding their side. ISFPs are more focused on following their own path and so they don’t like letting pride stand in their way. For the ISFP it is best to focus on themselves and doing what feels right, and often this leads them to being more open around those they love. For the ISFP pride can be something they are weary of when it comes to who they choose to let into their lives. Instead they want someone who they can share themselves with and who will do the same in return. ESFPs aren’t often prideful people, and so they aren’t afraid of letting their guard down. ESFPs simply focus on living in the moment and search out the things which excite them most. They want to be able to open up to those around them and really share themselves. ESFPs don’t like allowing pride to hold them back or prevent them from experiencing life to the fullest. 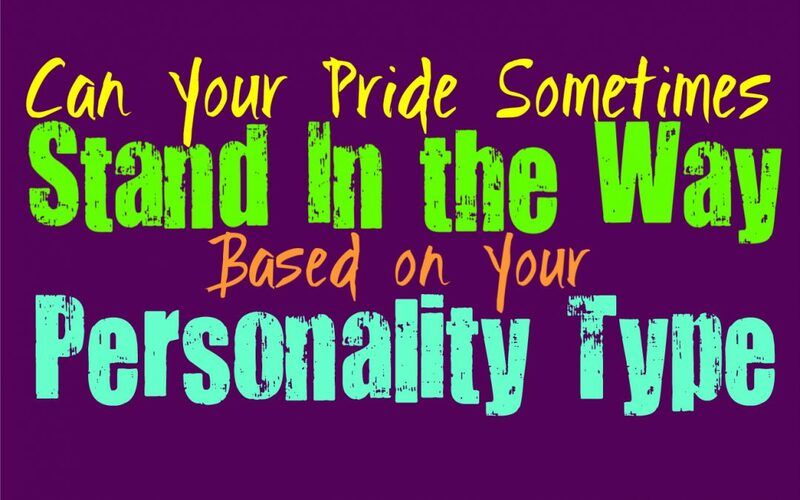 Most of the time they aren’t likely to allow pride to hold them back or stand in their way.